Do you give a Dame? If we were to focus solely on the ads we see on TV and in magazines, we could be forgiven for thinking that the biggest problem that periods cause is the one surrounding how we are to feel confident and ‘leak-free’ in a pair of white jeans or a bikini when we have ours. And that’s even before we get started on the mood swings and sugar cravings. Astonishingly, the average woman will spend close to £20,000 in her lifetime on menstrual products. Personally – and I’m 100% certain that I’m not alone on this – I can think of things that I’d rather spend my money on – but even putting my own finances and lust-lists aside, what I’ve only recently woken up to is the environmental impact that sanitary products have. This seems crazy to me, because I’ve always considered myself to be a reasonably eco-conscious person. For almost as long as I can remember, I’ve taken steps to reduce, reuse and recycle. The gift list for my overseas wedding asked people to buy trees on a CO2 initiative to offset their flight emissions. I drive a hybrid car. I turn off taps and lights. I pick up litter and would never dream of putting rubbish anywhere other than the bin. But periods? Yeah, bit of a pain … yeah, cramps sometimes, headaches often … oh my god and that time I got my period when I was at that guy’s house … Environmental impact? Never. Even. Occurred to me. According to the Women’s Environmental Network, those same tampons and pads generate more than 200,000 tonnes of waste each year, as well as containing high quantities of plastic, which doesn’t biodegrade – so it ends up in landfill, or in our earth’s waters. There’s the matter of wrapping and packaging to consider too. In 2010, a UK beach clean found an average of 23 sanitary pads and 9 tampon applicators per kilometre of British coastline. Kind of puts whether or not you feel good in your bikini into perspective, doesn’t it? So why the reluctance to get on board with menstrual cups or similar products? 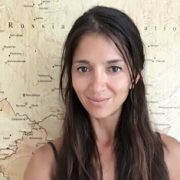 Celia Pools and Alec Mills wanted to understand what was holding people back from making environmentally sound choices around their periods and discovered that a reluctance to change habits was the main barrier: for many women, even wanting to have more eco-conscious periods didn’t mean that they felt okay about using a cup or laundering reusable cotton pads. Pools and Mills discovered that around 60% of women who use tampons prefer to use an applicator for insertion – so they decided to make it easy for them by developing a reusable one that works in exactly the same way as an applicator you’d find in a box of tampons, other than the fact that you need to put the tampon into the applicator yourself. As the brains behind UK start up Dame, they’ve developed a solution that employs antibacterial medical-grade material to keep it clean and safe – it can be wiped with toilet paper, rinsed and used again. In between periods, it can be stored in a tin which has been attractively designed and won’t look out of place in your bag or on your bathroom counter. 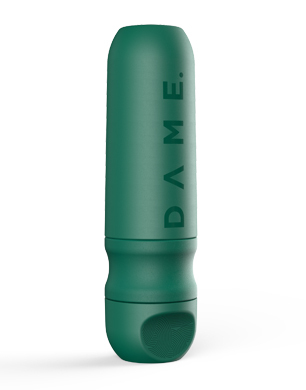 The product comes with a lifetime guarantee ensuring that if, for some reason, any part of your Dame ever needs replacing, they’ll do so free of charge – and the brand is also launching a range of organic tampons, completely free of any bleach, rayon, pesticides or perfumes. You can get involved and start having healthier, more sustainable periods on Dame’s Kickstarter page. And if, like me, you have years of plastic use and waste in your past and are probably looking at your last £5,000 – £10,000 of period spending, then it’s even more important to make a difference, not just by switching while you still can, but by educating young people about alternatives and helping to make those alternatives widely available for them in the future.